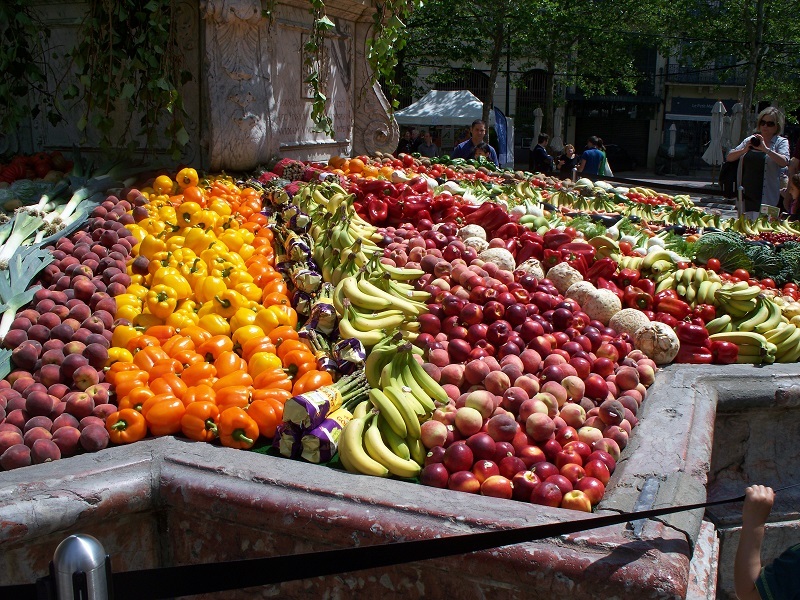 For three days every week, the main square in Carcassonne is filled with vendors of fresh fruits and vegetables. There are farmers who grow the produce in fields just outside the city alongside business people who buy whatever is in season a few miles away or even further south into Spain and bring it to sell on Place Carnot. 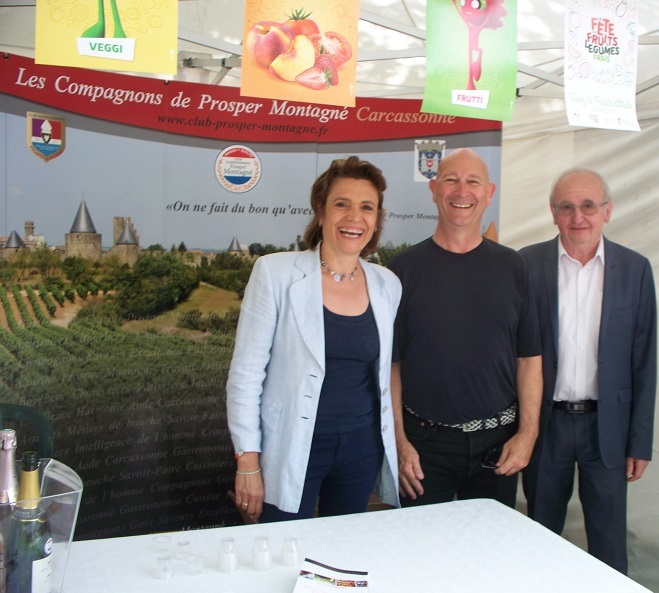 It was only appropriate, therefore, that this was the location for last Saturday’s Fraîch’ Attitude Fruits and Vegetables Festival. In the center of Place Carnot, the marble fountain of Neptune, completed in 1771, normally has water cascading from the top into 4 pools around the edge. For this weekend, ivy replaced the falling water and brightly colored fruits and vegetables filled the pools below. Booths were set up around the square where representatives from the city and local service organizations promoted healthful eating with free food samples, cooking demonstrations, and family craft activities. As at every other function we’ve gone to on the square, many elected officials, including the mayor, were giving speeches, visiting booths, and talking with attendees. Although this fête was directed primarily at children and young families, adults were certainly not neglected. We arrived just as an orchestra had finished a performance that was quickly followed by the band called Anonyme (Anonymous) that had us all tapping our feet to their upbeat tunes. 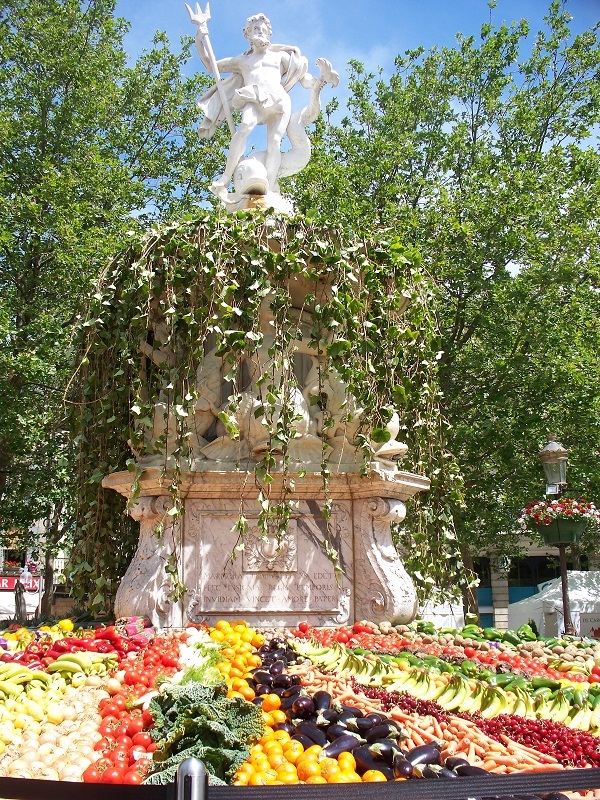 Since this was a festival saluting vegetables and fruit (juices too! ), there was of course a wine tasting booth. Just south of Carcassonne is the town of Limoux where bubbly French wine got its start. Representatives from vintner Antech were pouring their Blanquette (Mauzac grape) and Crémant (Chardonnay with Chenin grapes) and here you see Bill volunteering to staff their booth. Aren’t we supposed to be consuming between 5 and 9 servings a day? Posted on June 14, 2016, in Life in France and tagged Americans in Carcassonne, Community, Wine. Bookmark the permalink. 1 Comment. Antech’s blanquette is one of our favorites. We were just down the street, moving furniture from one apartment (just renovated) to the other (under renovation). By the time we were done, we were far too dirty to be seen in public so we missed out. But bits of music drifted through the open windows. Seeing the photos I wish we’d made it.